It is quarter past twelve my side of the world. 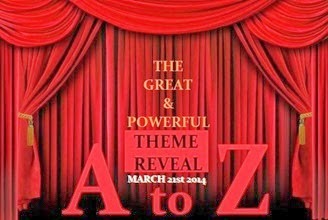 Officially the day we are going to release our theme for A to Z challenge for April is here. A- Z of being in your mid twenties!! Tada. Yes I am now on that stage of life when I will do anything and everything to desperately hold onto my twenties 😀 And so decided to write twenty six posts on being a mid twenty! Watch this space starting from 1st April for all the hoopla of being a crazy mid twenty and and a scared entrant into the dreadful thirty. Use the hashtag #A2ZChallenge to read more on the participating posts. Apart from this we stumbled upon another challenge in April and we have decided to combine that as well. Indie30 is a blogging project to connect like-minded creative travelers. Each day, a prompt having to do with long-term, independent travel is shared. The prompt is meant to inspire your post, art, video or how you express yourself in the context of indie travel. You can connect on twitter by using the hashtag #Indie30! Yes we are crazy enough to take up another challenge! Ultimate Blogging Challenge will also be weaved through and so officially this April will see us taking part in a total of three blogging challenges! For this use the hashtag #BlogBoost to read more of the challenge posts. I know what you are thinking, I am the Barney Stinson you never met- CHALLENGE ACCEPTED! Anyways all you dear Robins (Ref back to Barney Stinson 😛 ) I will need you people a lot during April. You will be my energy drinks all those thirty ‘challenging’ days!! As I told you before you are a craaazzzy gal but your energy is so infectious! Lots of best wishes to you!! Promise to be your Robin and provide rock solid support throughout! Cheers! Hope you have fun in Pune too! You sure are brave to be taking this on…am already going crazy with the packing/unpacking and shifting thing and i hope i complete this one challenge i have taken on. You? Bring it on! I am sure you would complete it with flying colours! mid twenties!! // Yippppeeeeeeee – That will be so lovely for me cos I am entering mid-twenties this year!!!! Thats interesting!! And wish you all the strength to manage everything, I know you will rock it, just like everytime! Quite interesting theme! If you find a way to cage 20s, do tell me too. Good luck for all the three challenges. Thanks a lot 🙂 and well you are here so why don’t you find out! Interesting theme. Very brave of you to take on that other challenge, as well. Good luck! SOunds great! All the best! Sounds like an interesting 26 posts – the 20s were a good age. Yes 20s are a good age! Gosh Girl! your energy is infectious! 3 blogs- all the best. You will totally rock Pune and the challenges. Whew… you’re one gutsy lady. Love the bit on ‘bag, baggage, husband[ :-D. Oh and WELCOME TO PUNE!!!! Best of luck with everything. All this along with the move…good luck to you girl. Yet to come around my theme for A-Z…have a few in mind, need to finalize today so that i can plan posts then. April is an exceptionally busy month for me too. I loved when I turned 30, but I can understand the desire to remain in your 20’s. Best of luck to you on your blog. Well I am hoping you would share some of your thoughts and perhaps then we can all get enlightened while joining 30! Wow! Two blog challenges in one month plus a relocation! Looking forward to reading your posts. Welcome to Pune!! 🙂 Posted my theme as well. Fabulous theme, mid-twenties for me seems so far away 🙂 Look forward to reading your posts. Well Sulekkha I hope you enjoy them too! Wow Barney. You sure gonna be Legen – Wait for it – dary , Legendary. All the power and strength to you girl. And rock with the mid twenties theme. I have revealed my theme too. Don’t forget to check it. Aren’t you a brave young woman? But I know you’ll do great! Good luck, Richa! Thanks Corinne and well I believe along with brave I am crazy too! Wow! You’re going to be very busy in April! Good luck with your move, and congratulations on joining all these blog challenges! Here’s to your success! I don’t even remember my mid twenty’s…lol I guess I can now live vicariously through your blog posts, for at least the month of April anyway. Can’t wait to read what you write. Good luck with all your challenges! This will be my first A to Z Challenge. I hope it turns out to be as much of a fun read as fun write for me! I’m very excited and have you booked on my must read list during A to Z. As a indie traveler, I am also on the look out for some great tips and advice. Thanks sweets well this challenge will be all about exchanging data! hats off to you girl…..
Three challenges and moving!? Well, I’ll tip my hat to you, because you’re either totally crazy or a genius (I’m guessing the latter applies;)). But hey, enjoy the twenties! I love your blog header. Where is that beach? welcome to pune. all the best with challenges. Haha none of us are but I am sure you would rock it! I’m exhausted just reading it- Your 30’s and 40’s self will love reading your twenties perspective and I imagine plenty of bloggers from #atozchallenge and the other hops will too. Thanks for stopping over at Life In Dogs earlier; your encouragement means a lot. Dreadful thirty? Ha! May you enjoy your youth. I turn a delightful thirty-two tomorrow! 😉 See you back around for the 26 days of being in your twenties. heehee, I’m well past my twenties and moving into my forties, but this looks to be an exciting topic. I don’t know how you will manage with everything on your plate, but I wish you well and will be popping by to check in throughout the month. I’m participating in AtoZ, as well. My topic is writing in general and my current work-in-progress in particular. See you around! I’ve never lived in Pune, but I’ve been on many short visits since I was in my early twenties. For a variety of reasons, it’s one of my favourite cities.